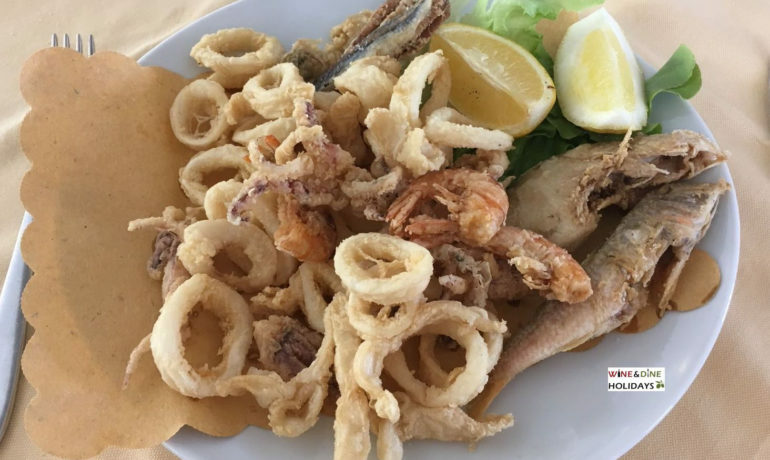 The history of fritto misto di mare (mixed fried seafood) already begins in ancient Rome. It is in fact named as a succulent dish in a song of Apicius, and continues throughout the Middle Ages and the Renaissance, where it was accompanied by complicated spicy sauces. It is now a second dish of great occasions, which brings together big and children, greedy or not. The term fried mixed seafood is very generic. 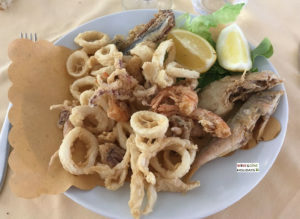 There is frying that includes only shrimp and calamari, often called “fried without thorns” that is without fish with herringbone (usually the most suitable for children), or fried fish, that is what was once considered the “remnant” of the fishermen’s boats, and which consists of mullet, cod, sole and anchovies. To enhance the flavor of frying and clean the mouth from the greasy of oil are indicated all acid and sparkling wines: Prosecco, Garganega and Pinot Bianco are some of the most pleasant solutions amoong white wines. Considering still wines from one of the oldest Italian wine production area, the white DOC of the Castelli Romani reveals rich in structure and freshness. It is suitable for the purpose of supporting the contrast with the flavor of fried, thanks to the right amount of bubbles. Frascati DOCG and especially the lately available sparkling version should not be missed too. Otherwise, going to another volcanic wine production area, a glass of Falanghina, a wine of controlled origin typical of Campania, of the Campi Flegrei area, which manages to have a good base of acidity to counteract the fried taste of fish. Another option is Vermentino, a very aromatic white wine, that has the right freshness and the right degree of flavor to be combined with the typical sea flavor.